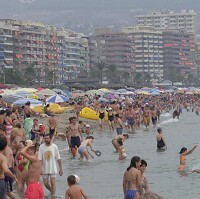 Sun-loving holidaymakers headed to Spain this summer with the European country attracting the largest number of British tourists. Skyscanner, a flight search website, said the US, which came second in the list of top holiday destinations last year, had fallen to third place followed by Italy at number four and France in fifth place. Taking a staycation on home soil was the second most popular. The report into travel trends revealed countries which have been experiencing economic difficulties had seen an increase in British travellers searching for deals on flights before going on to organise their travel insurance. The number of Brits looking to travel to Greece had risen by 63% from 2011 while 45% more people wanted to fly to Portugal. Flight searches for Italy were also up 38% from last year. One of the most popular long-haul destinations, along with Thailand, Australia and the UAE, was India. During the summer months, the number of Brits looking for flights to India leaped 66% compared to the previous year with even more wanting to travel there to escape the cold at home with searches rising by 114% during the winter. The steepest rise in searches was Burma, which saw a 125% increase. Sam Poullain, from Skyscanner, said a lot of people had travelled in 2012 despite the bleak economic situation with sunny locations proving popular because of wet weather at home.